Lawmakers from both sides requested the Speaker to appoint a Parliament Select Committee to investigate the controversial disclosure of Industry and Commerce Deputy Minister Buddhika Pathirana on milk powder imports. Making a personal clarification and rejecting allegations that he was misleading the House with false information, the Deputy Minister stated that he has not disturbed the Parliament at any point and has only raised matters of national importance in the past. According to Pathirana, he has full backing from his Ministry to act on the complaints received regarding the contaminated New Zealand milk powders. “The Minister of Industry and Commerce assigned me to take up the contaminated milk powder issue in a communique channelled through the Secretary of the Ministry. What I am engaged in is not a media campaign to attract attention. I did not bring in Point of Orders to disturb the House. I have not used double meanings and hints in Parliament,” he said. “I stand by my statements based on the complaints received by the Consumer Affairs Authority and my office. So, appoint a select committee to investigate the complaints and take actions to conduct tests. I have not named any milk powder company even though some other lawmakers did in Parliament. However, Fonterra company came forward with a statement,” he said, standing up to protect his recent reveal in the Parliament where he pulled up the contaminated milk imports from New Zealand manufactured using questionable ingredients, including fat extracts from pigs and palm oil. Tabling a newspaper advertisement jointly published by the World Health Organisation and the Ministry of Health naming 21 illnesses caused by drinking milk powder, the Deputy Minister said: “Melamine and DCD issues came up some time ago. The ITI conducted tests and Minister Champika Ranawaka strongly accepted the lab reports, but the Ministry of Health neglected the lab findings and changed the story, dragging a bacteria story into the mix. When Director General of Health Services Dr. Palitha Mahipala suspended milk powder imports, diplomats came from New Zealand to hold a discussion with our Government. 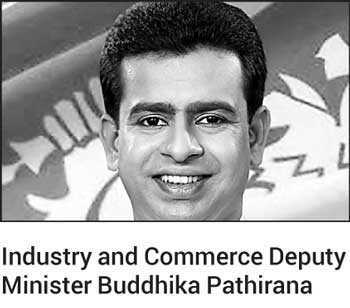 Deputy Minister Buddhika Pathirana on Tuesday made a controversial statement in response to a supplementary question raised in Parliament. According to him, instead of 100% natural milk, the respective imports from New Zealand are suspected to also contain animal fat extracted from pigs and cattle as well as palm oil.